Home Tags Posts tagged with "Penn State University"
The 17th annual Penn State Equine Science Showcase and Quarter Horse Sale will be held April 27 at the Snider Agricultural Arena at Penn State's University. Penn State Berkey Creamery is bringing back Flavor Madness, the online tournament in which ice cream fans can vote weekly for their favorite flavors. 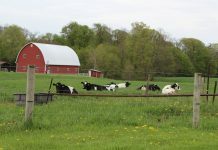 Six Holsteins bred to improve genetic diversity were born at the Penn State Dairy Barns last April. Find out how these claves are doing a year later. Two electro-mechanical engineering technology students have become finalists in a competition in April for student-led businesses throughout Penn State. Penn State junior Elliot Redding is getting hands-on experience doing what he loves from landscape competitions to networking to mountain biking. After a successful launch, the Dairy Production and Management MOOC is now offered in five languages — English, Spanish, Bulgarian, Chinese and Portuguese. Those who want to learn more about raising sheep or goats in southwestern Pennsylvania can attend workshops sponsored by Penn State Extension.